With a hint of row-house flair, the Astoria boasts almost 3000 square feet of charming details and ultimate livability. 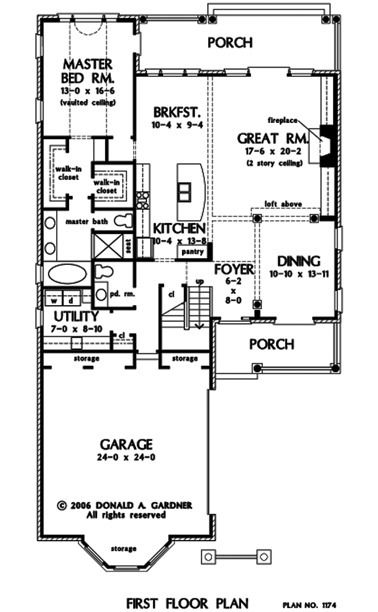 From the minute you walk through the foyer, an open layout is apparent. Columns designate the entrance to the dining room, which immediately spills into the great room and breakfast area. Entertaining is a breeze with this open layout from one room to the next. 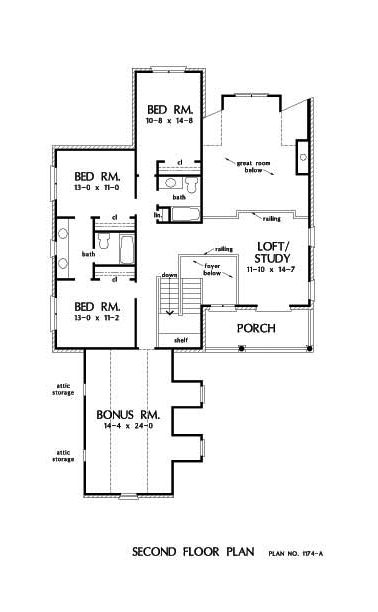 The master suite is on the first floor for complete privacy, as no other bedrooms are near it. A vaulted ceiling adds vertical volume and dual walk-in closets are an added bonus. The elegant master bath is comprised of twin vanities and a separate bathtub and shower. 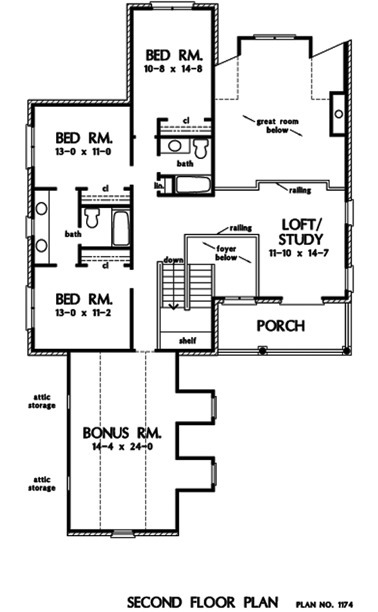 Upstairs, three secondary bedrooms share two bathrooms, one of which is a Jack-and-Jill. A spacious loft/study overlooks the great room below, and a large bonus room becomes the perfect place for kids to play or as a gentleman's retreat. 1st Floor: 1810 Sq. 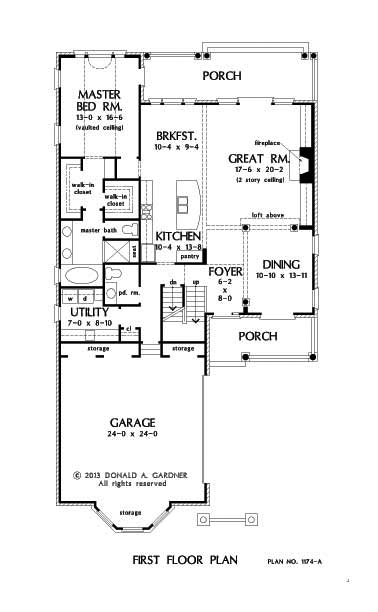 Ft.
2nd Floor: 1159 Sq. Ft.
House Dimensions: 43' 7" x 80' 3"
Great Room: 17' 6" x 20' 2"
Master Bedroom: 13' 0" x 16' 6"
Bedroom #2 : 10' 8" x 14' 8" x 8' 0"
Bedroom #4 : 13' 0" x 11' 2" x 8' 0"
Bonus Room : 14' 4" x 24' 0" x 8' 0"
Breakfast Room : 10' 4" x 9' 4" x 9' 0"
Dining Room : 10' 10" x 13' 11" x 9' 0"
Foyer : 6' 2" x 8' 0" x 18' 1"
Garage Storage : 13' 0" x 2' 0" x 0' 0"
Garage Storage Bay : 12' 3" x 0' 6" x 0' 0"
Great Room : 17' 6" x 20' 2" x 18' 1"
Kitchen : 10' 4" x 13' 8" x 9' 0"
Loft / Study : 11' 10" x 14' 7" x 8' 0"
Master Bedroom (Vaulted): 13' 0" x 16' 6" x 0' 0"
Porch - Front : 18' 0" x 7' 4" x 0' 0"
Porch - Other #1 : 18' 0" x 7' 0" x 0' 0"
Utility Room : 7' 0" x 8' 10" x 9' 0"